Just before our last camping trip, I checked under the bed to see if I had anything stored there. I was shocked to see what appeared to be water stains on the support platform for the bed. We’ve found and repaired so many leaks over the years, and I was really, really hoping this wasn’t what it looked like. After some heavy rain, I checked under the bed again. I put some toilet tissue between the pinchers of a long-reach grabber tool and pushed the paper along the floor and carpet in the corner near the bed frame. When I pulled it back out, the paper was wet; not saturated, but definitely wet. Not good. 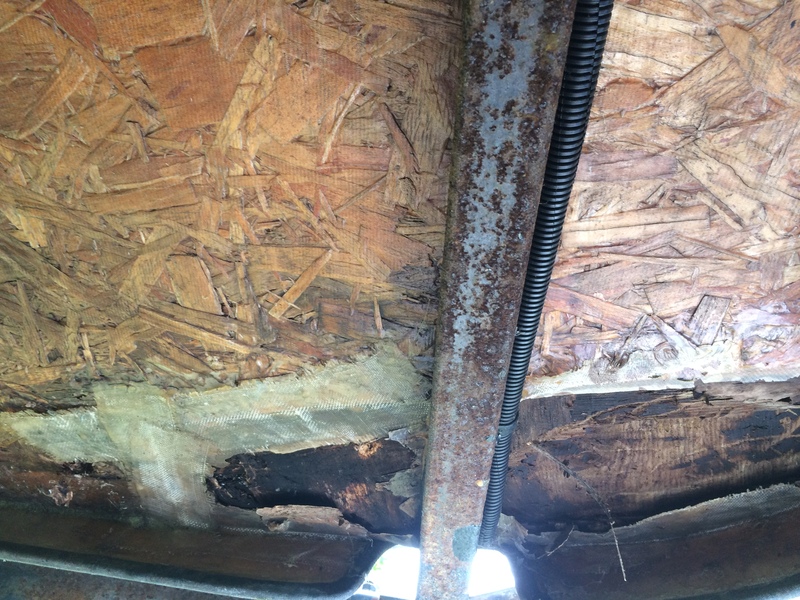 When I looked UNDER the trailer, I could see that this area had been PATCHED at some point by a previous owner. And when I touched the wood, it felt damp and spongy. SERIOUSLY not good. It seemed pretty clear that someone had made an attempt to fix the obvious problem (the floor) without first finding and repairing the cause of the problem (a leak). By building a full-sized, permanent bed in the back, we’d been totally unaware that this was happening. However, now that we were aware of it, we had to decide what to do. If we’d discovered this when we were just starting to renovate our Scamp, it would have just been one more project on the list. But now…? 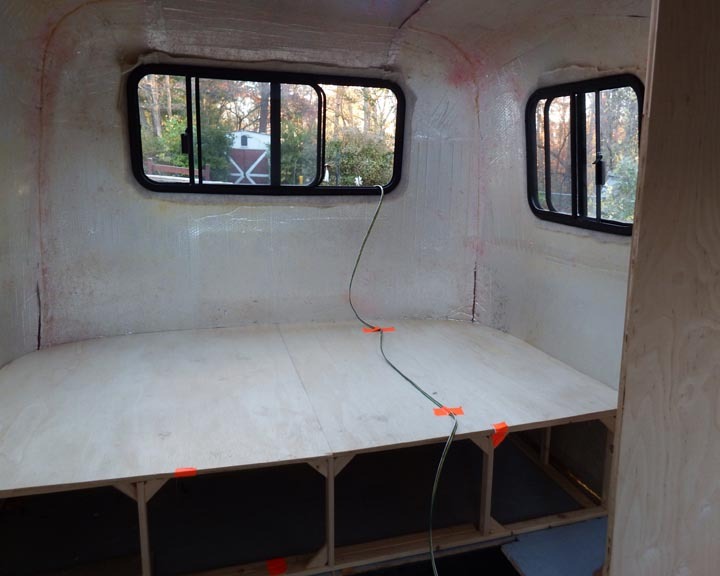 We love this little trailer. We’ve taken it from “shell to shelter” over the last few years, and we’ve taken pride in all of the work we’ve done. 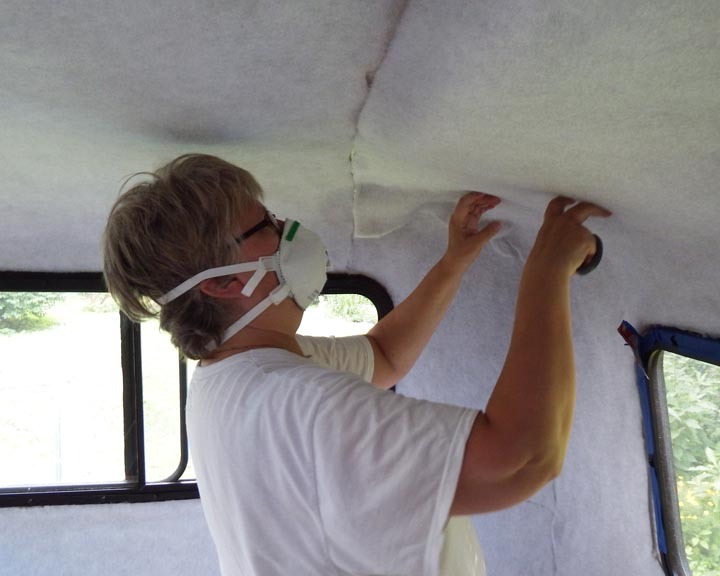 We dusted off old skills and learned new ones in order to create our cozy and comfortable little house on wheels…. 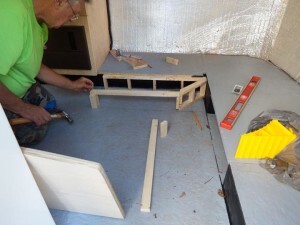 While we were planning a variety of upgrades (such as putting in a fridge, a sink, maybe a stove, etc. 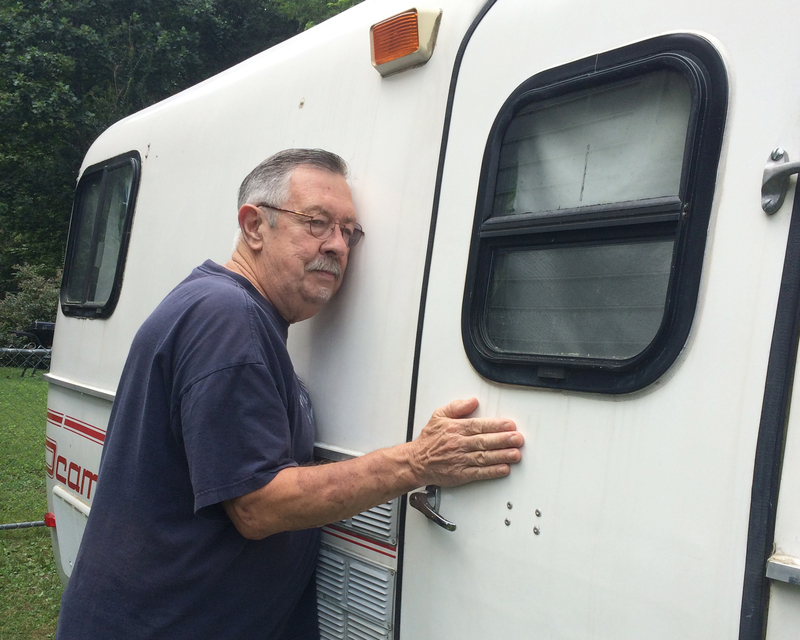 ), the thought of doing more repairs on the trailer made me feel both sad and frustrated. I also wondered if we were physically up to the challenge of doing the type of work that would be needed to fix this latest problem…. 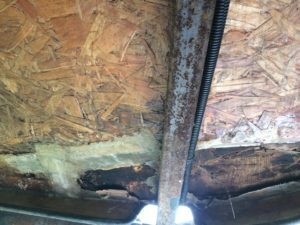 And with just a few weeks left before the start of the school year, did we really want to spend the precious time remaining ripping out the whole floor in the back of the trailer and possibly tearing out sections of the wall and ceiling covering (again) to look for leaks? 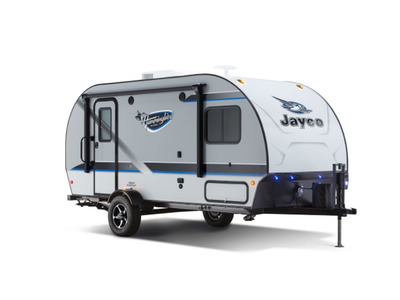 At our first stop, we checked out a Jayco Hummingbird. 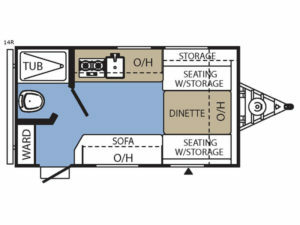 Certainly a nice trailer with an interesting floor plan, but as before, we liked it, but we didn’t love it. On the positive side, I got an estimate at their shop for repairing the 7-pin plug and wiring on the back of my car, so that was a good thing. At our next stop, we drove past a few behemoth-sized trailers and parked near a small Coachmen Clipper. Interesting…. Hmmm, VERY interesting! 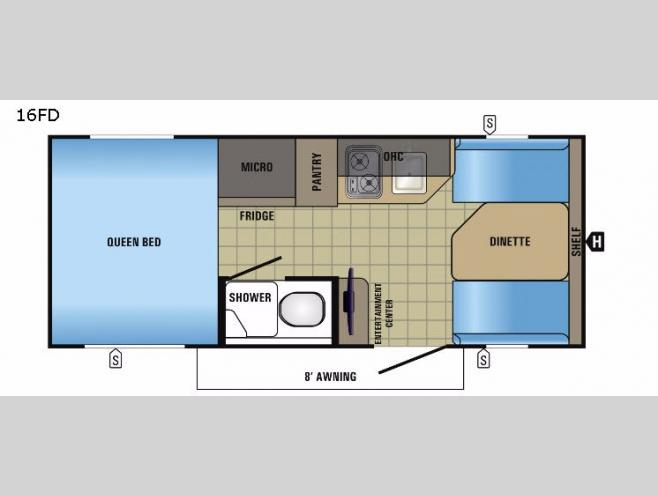 While it didn’t have a separate bed and dinette (which would have been ideal), I was absolutely giddy looking at things like the amount of storage, the screen door, and the awning (as well as the stove, sink, fridge, bathroom), and for me it was love at first sight. It was a 2015 model, looked brand new, and it was offered at an excellent price. 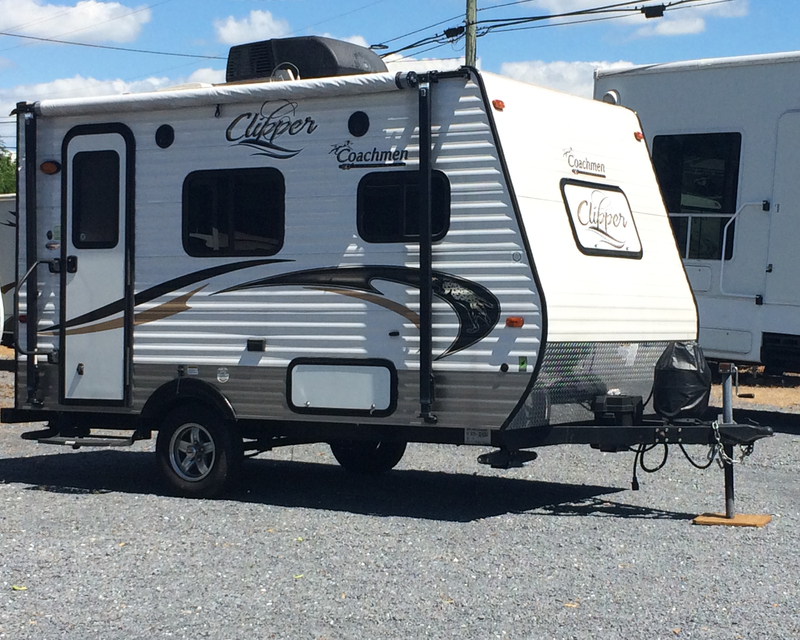 With the spare tire on the back, the Clipper was about a foot longer than our Scamp, about 10″ wider, 2 ft. taller (with the A/C on top), and about 800 lbs. heavier–all still well within the towing capacity of my car. This could work! It had everything in it we’d ever need for local camping or extended road trips, and if the dealership had taken credit cards, I would have bought it on the spot. 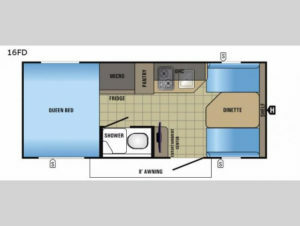 Instead, we verbally committed interest in the trailer, and I said I’d need to figure out how to pay for it since my credit card wasn’t an option. I offered to make a deposit, but the dealer said there was no need to–I could pay for it when we picked it up in a few days after they’d had time to clean it up and check to make sure that everything was working correctly (since it had just come in). He also said they’d repair the 7-pin plug on my car and modify my hitch assembly to accommodate the anti-sway bar that would come with the trailer at no additional cost. Sounded great! So yes, I was psyched about getting this, and Wayne also seemed excited about it. But what about our sweet little Scamp? Obviously we didn’t need two trailers, and I’d need to sell the Scamp in order to make the purchase of the Clipper affordable. It made a lot of sense to get something that was ready to go anywhere, but after all the time, money and love that we’ve put into the Scamp, we found it was very hard to think of letting it go…. The emotional attachment to our trailer is real. After much thought and discussion, however, we made the decision to list the Scamp for sale in “as is” condition. I set the price fairly high, knowing the demand for this particular type of trailer, and almost immediately I started getting inquiries. People were definitely interested in it, despite the fact that it has no water, propane, fridge or bathroom, and even in spite of the fact that it had an undiscovered leak and needed to have the floor repaired. Saturday–the day after putting the trailer up for sale–Wayne woke up with what a friend called “Seller’s Remorse.” As he’d thought more about all of the excitement we’d felt when we finally found our Scamp, how we’d both done so much work to make it functional and comfortable, how much we’d enjoyed our “mini-vacations” with the trailer–well, he just didn’t want to let it go. 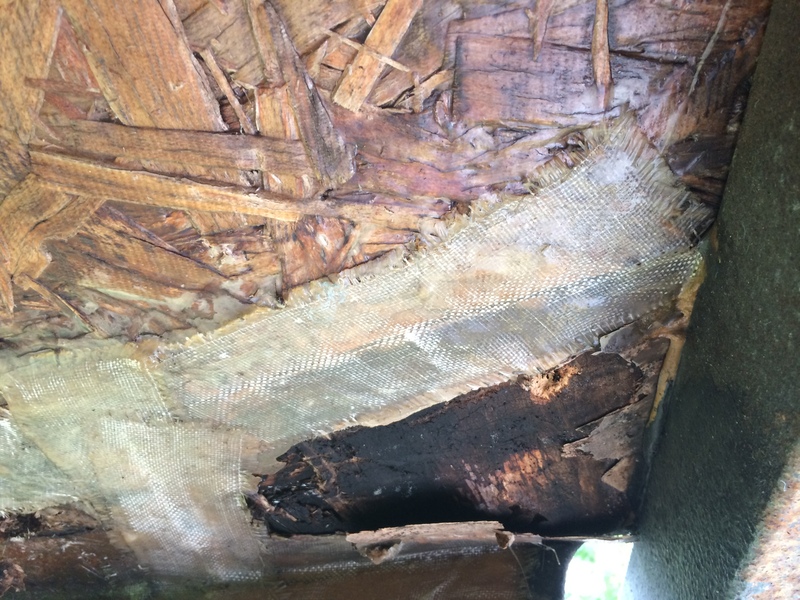 He felt that the repair work wouldn’t be TOO difficult (since we’d gotten a better look at the damage by removing the mattress and platform), and that it would be worth the effort to keep going with it. And so as I deleted all of the sale ads, he called the dealership and told them we’d changed our minds about the Clipper since we would be keeping our Scamp. I was left with a lot of mixed emotions. Like Wayne, I also love this little trailer. But separating the emotions from the reality, COULD we do the repair work? Do we really WANT to invest more time and money in the Scamp, knowing that even if we take care of these new issues, we’d still have a trailer without some of the most basic features one usually finds in a travel trailer? 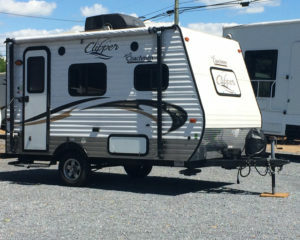 While I was kind of disappointed about not getting the Clipper, I knew that used “traditional” campers are always out there. We could probably find something comparable to the Clipper, at a decent price, within a 100-mile radius if we changed our minds again. 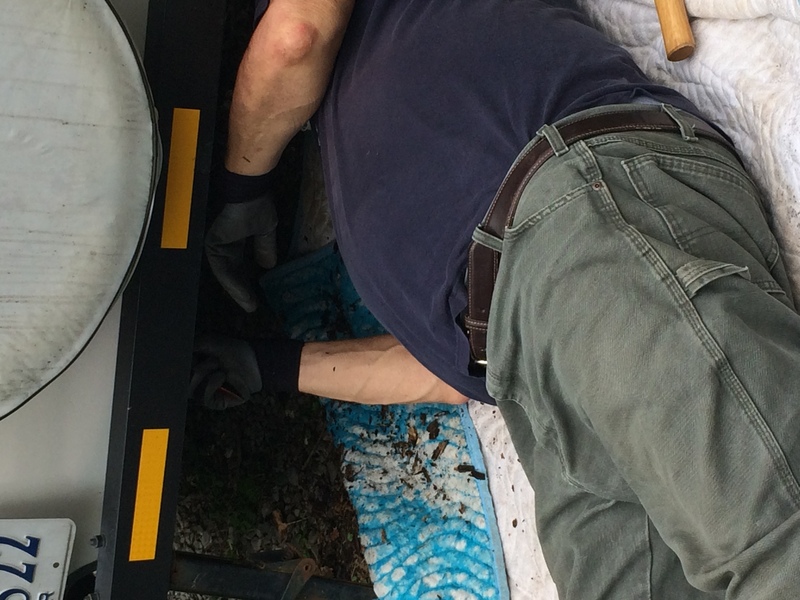 And so–just like old times–we went out to work on the trailer. 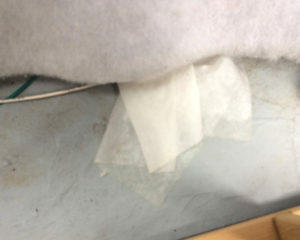 As a first step, we planned to remove and re-seal the rear window on the driver’s side. 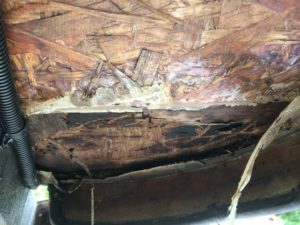 A few years ago we’d removed and re-sealed the passenger side window when we found that it was leaking, so we knew the process. 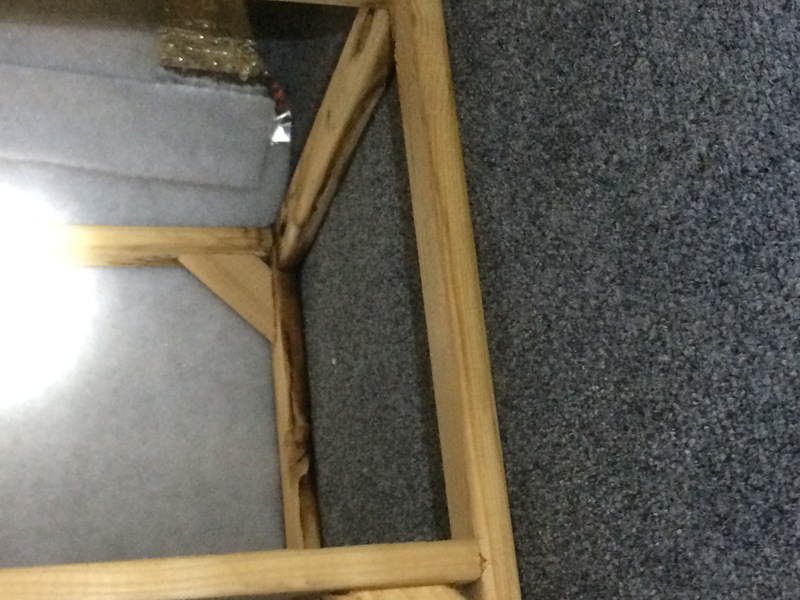 After removing the screws from the frame on the inside, however, the window just wouldn’t budge. 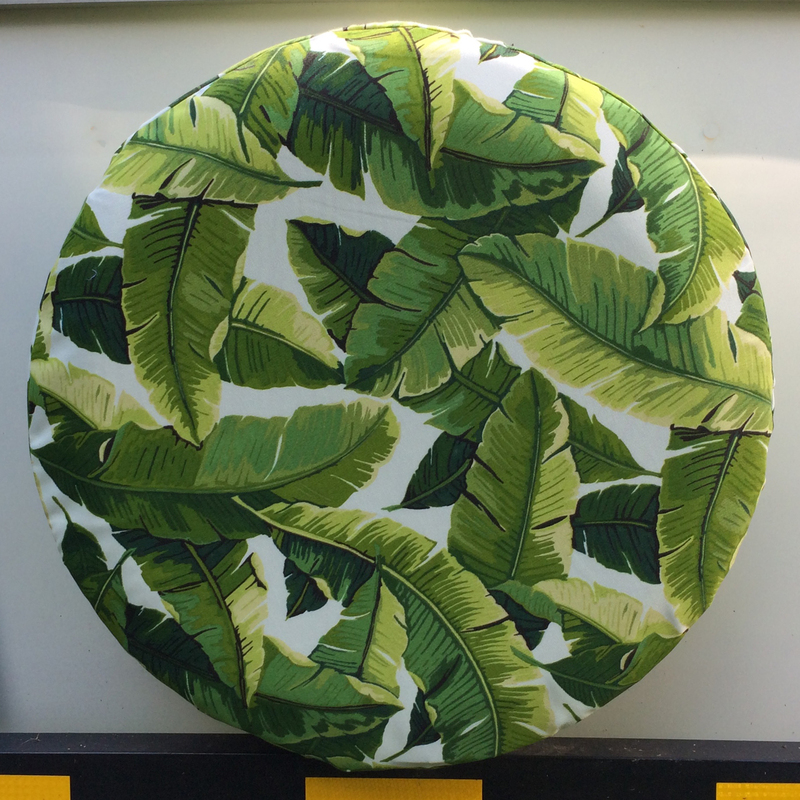 It was firmly seated in the wall of the trailer. Since the water damage on the floor wasn’t directly under this window, we decided it wasn’t worth possibly damaging it or the shell to try to force it out. Before starting to rip out the fabric and reflectix on the back ceiling and walls to look for more of the infamous pinholes in the roof, however, we looked for other possible sources of the leak. Hmmm, there were wires coming up through a hole in the floor in the “ground zero” section of dampness. 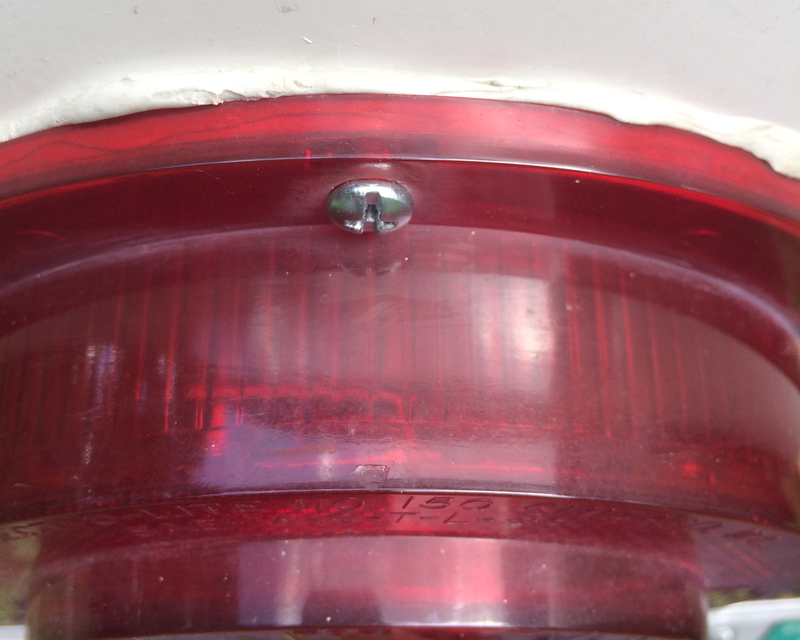 When we went outside, we realized this hole was directly below the driver’s side tail light–and that the tail light was in no way sealed to the body of the trailer. 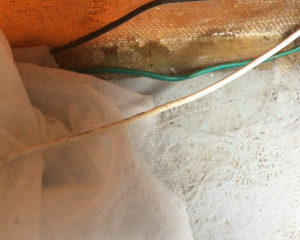 Was it possible that water was coming in behind the light and traveling down to the floor along the wires? 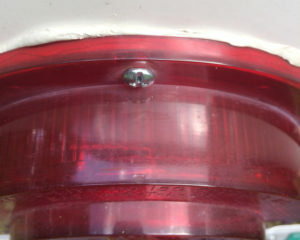 This seemed quite possible, so we removed the tail light cover and used butyl tape to seal the gap behind the bulb plate and the trailer. The tail light on the other side wasn’t sealed, either. 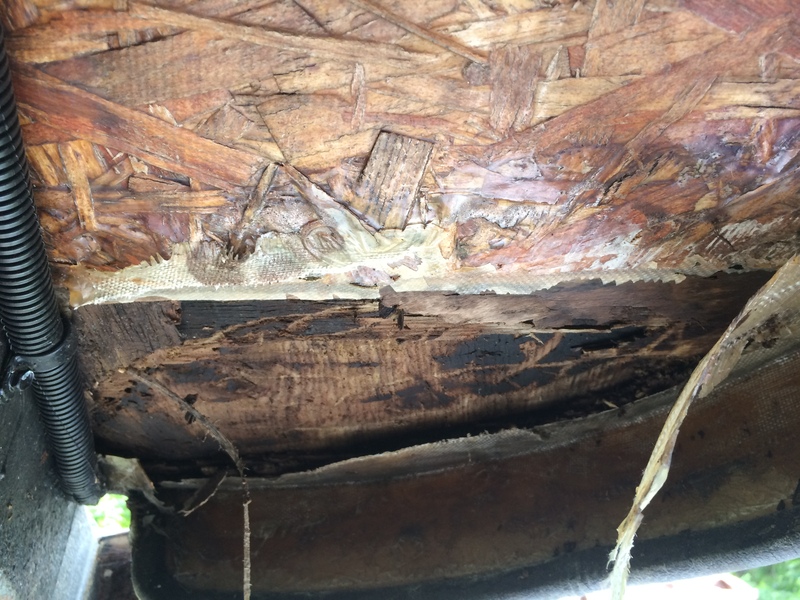 BUT, there was no hole in the floor under it, and there was no soft wood under the trailer in that section. As a precaution, we sealed that up, too. 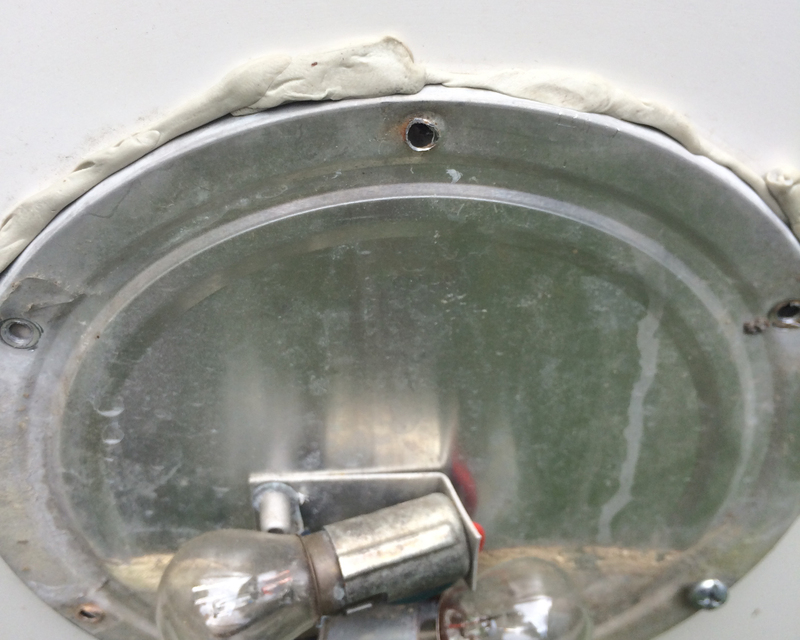 And while we were at it, we removed the covers on the 4 marker lights, found they WERE sealed to the trailer with butyl tape, but we cleaned it all out and applied new tape. With heavy rain in the forecast for the upcoming week (and for days), we decided to test our repair work on the tail light before doing anything else. 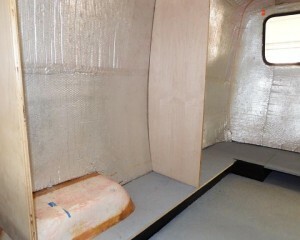 We placed pieces of paper towels up under the reflectix and hull liner all along the back end of the trailer. If anything leaked the towels should get wet…. We took a break at that point and went into town to buy more fabric for one of the spare tire covers that I’m making. 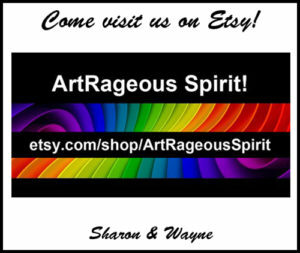 A woman in Texas wants one in this pattern in a custom size. 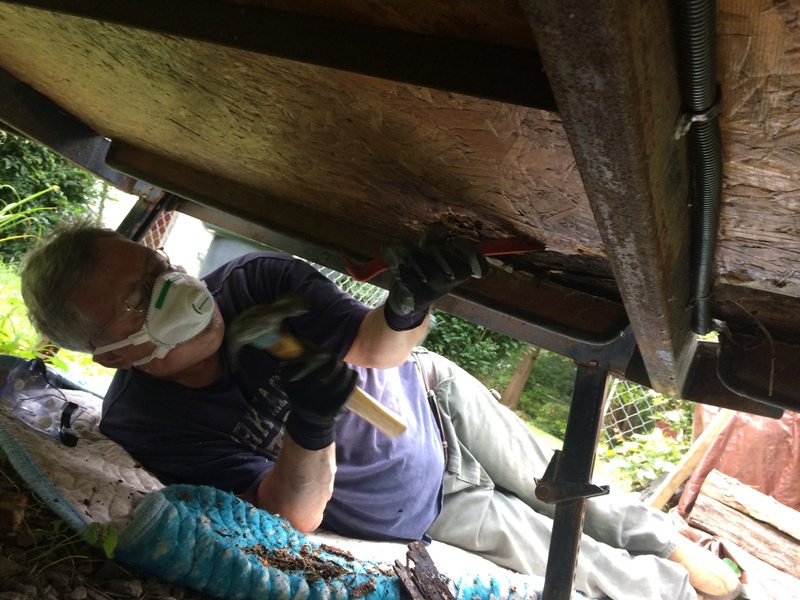 Wearing goggles and a mask, he was using a hammer and chisel to cut out the rotten wood under the trailer. 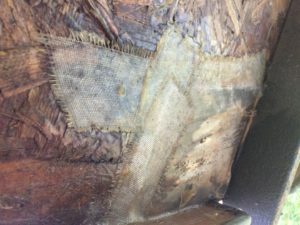 The bad news is that this wood has apparently been exposed to moisture for YEARS; it’s very soft and wet. The “good” news (if it can be called that) is that it’s not a huge area. 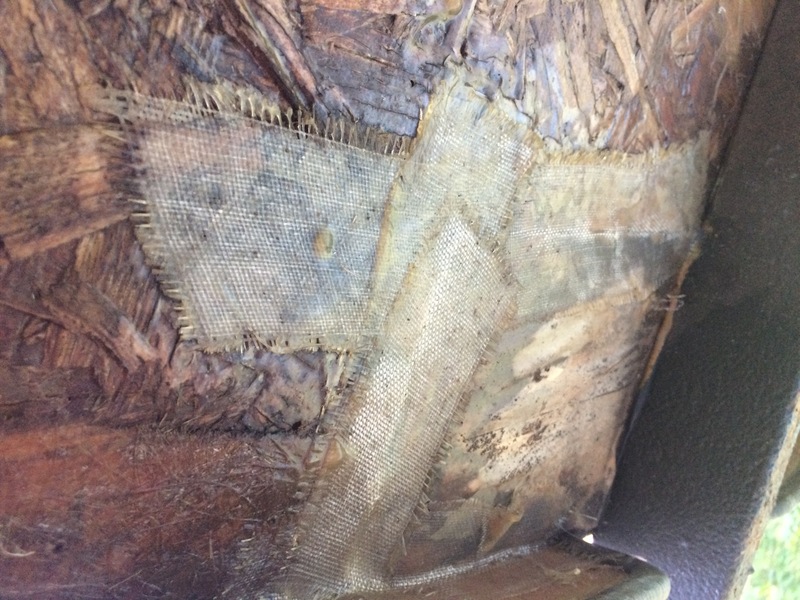 The damaged section could be cut out and correctly patched and sealed, so it wouldn’t be necessary to replace the whole floor in the back section of the trailer…. The next day, Sunday, July 22, we continued to talk about our options. As we counted our scratches, bruises, and sore spots from the previous day’s repair efforts, we realized that even though we probably COULD repair this small section of floor, it would take its toll on us, physically. Sad fact: we were in better shape four years ago when we started renovating the trailer than we are now. 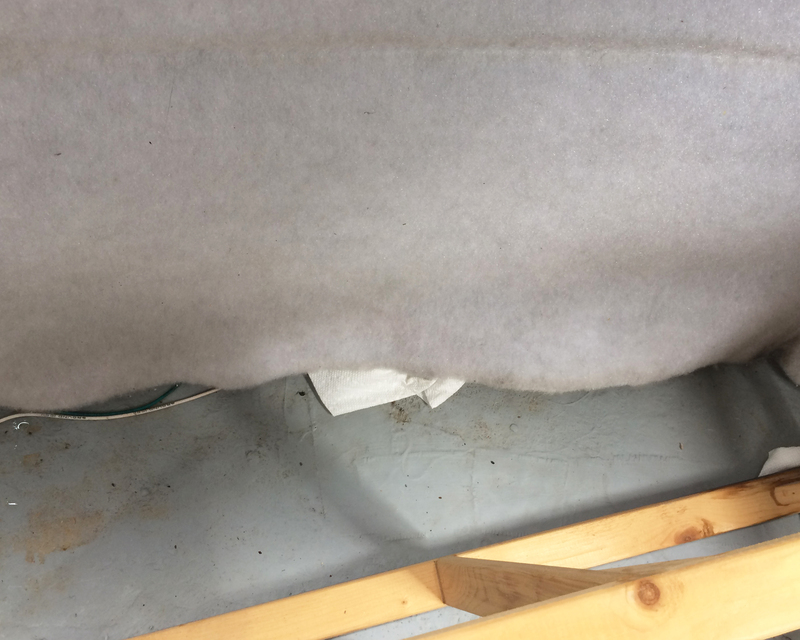 Could the leak be coming from the large rear window? We pulled back some of the hull liner and reflectix, and yes, it was a little damp (damp, not soaked). 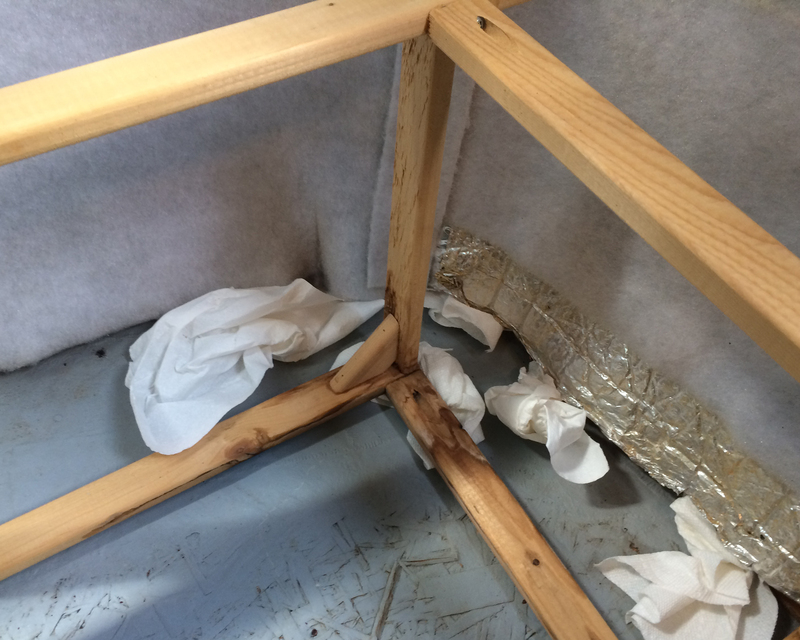 The “weep holes” are clear, but maybe the window needs to be removed and re-sealed with butyl tape. 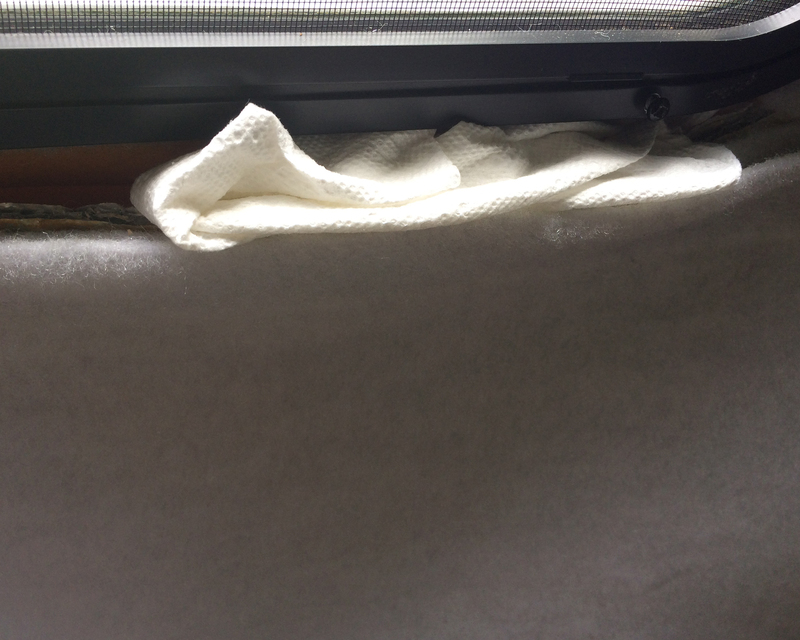 We dried the area under the window and stuck a paper towel there. We dried the floor and put a new paper towel there, as well, to wait for the next band of rain. And we continued to talk about logistics and goals. 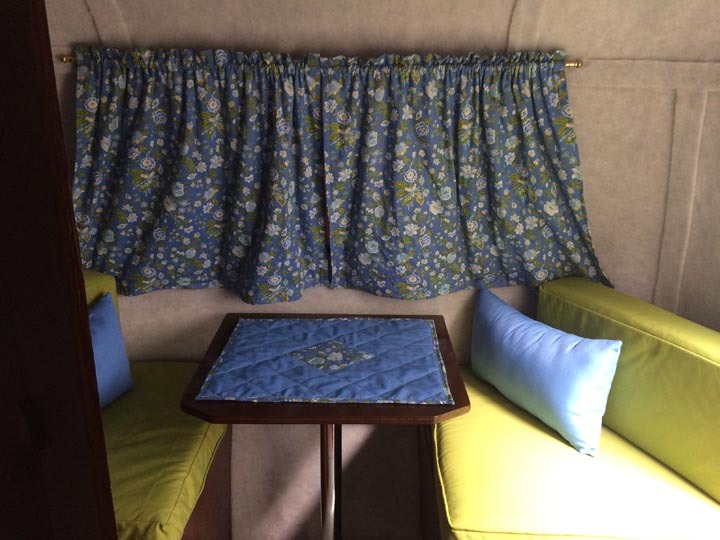 Our desire for a trailer initially had to do with our love of Virginia’s state parks. 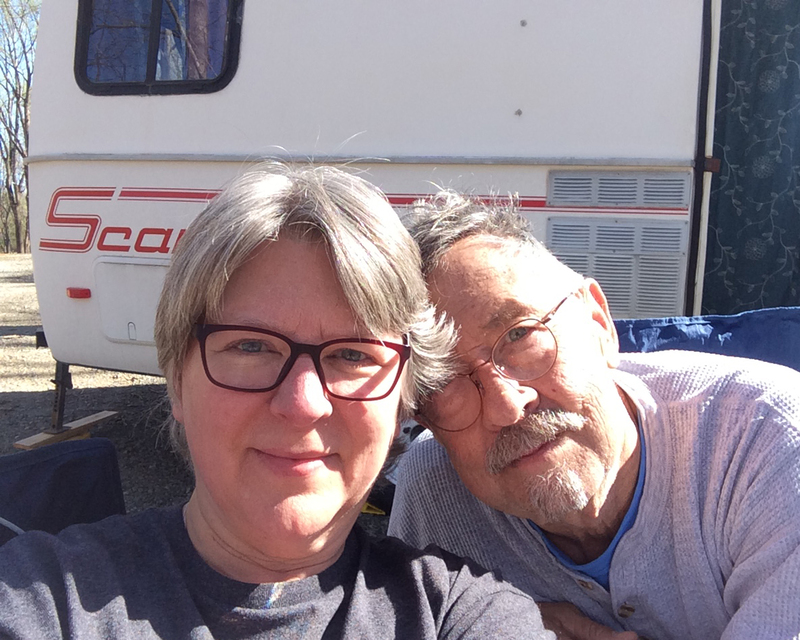 Some parks we’d hoped to visit are too far away to easily do as a day trip, and we thought it would be fun to be able to drive to one early on a Saturday, spend the night in a trailer, then come home the next afternoon. 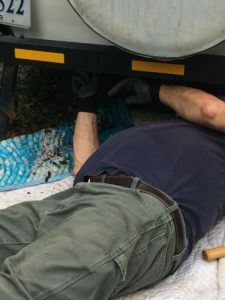 When we started looking for a trailer nearly 5 years ago, we were specifically looking for a 13 ft. Scamp because the car I owned at the time would have been able to pull it. When we couldn’t find one after many months of searching, we got a vehicle with more towing power to give us more options. We were still focused on Scamps, however, due to all of the reasons listed above. 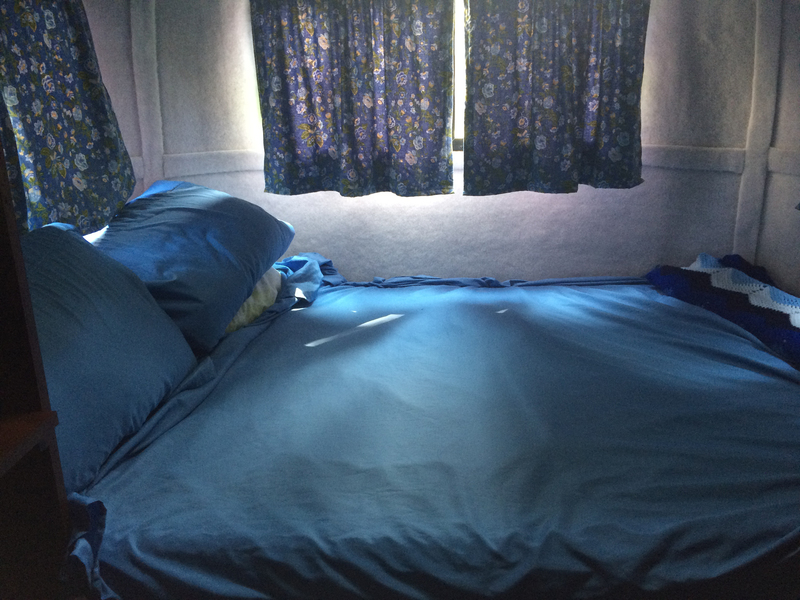 We enjoy camping–as long as we have electricity, bathrooms, and a comfortable, dry place to sleep (i.e. 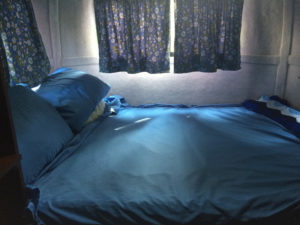 in a trailer). 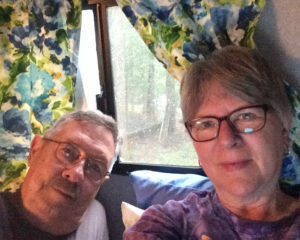 We agree that we could see ourselves continuing to go camping for maybe another 10 years or so, as long as health and circumstances allowed. 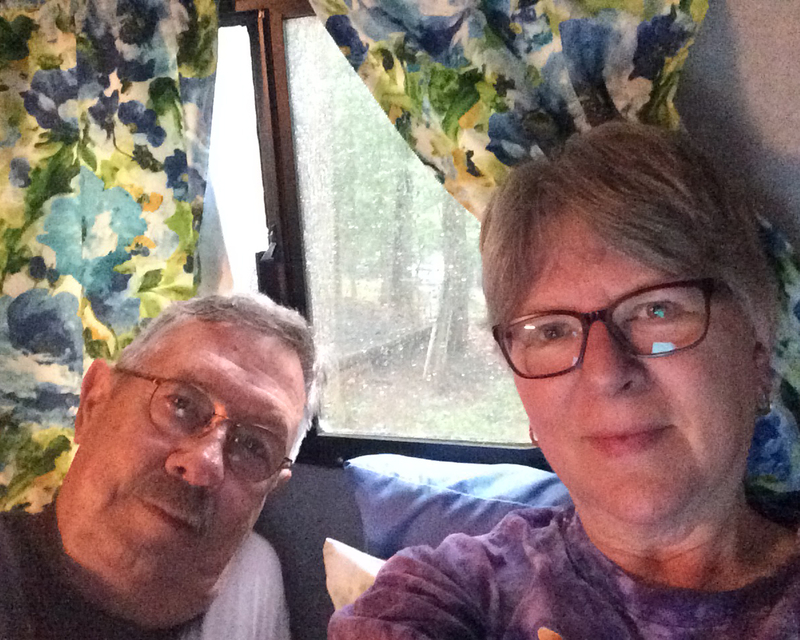 So now we have to decide if our goal is to just to do one- or two-night trips with a trailer. If that’s the case, then the Scamp, equipped as it is–but repaired–might be all we’d need. 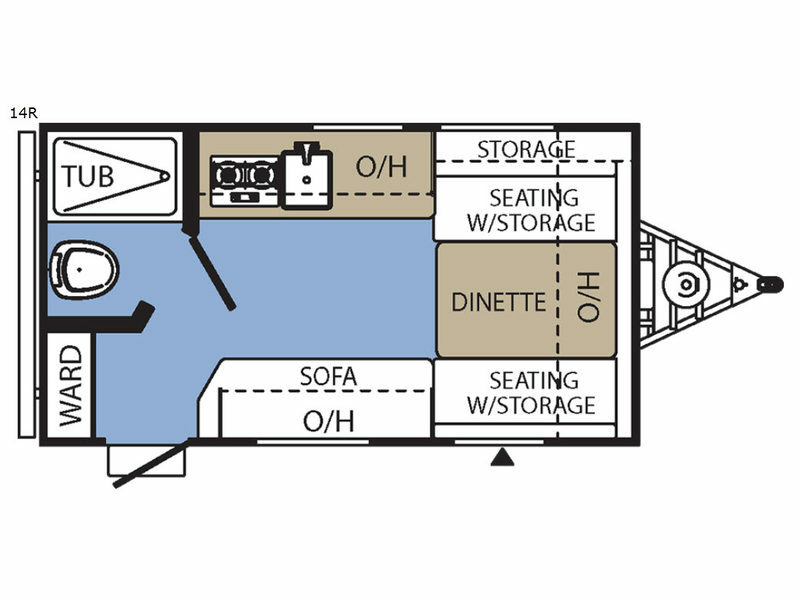 On the other hand, if we’d like to travel with a small trailer, it would be good to have something with at least a few more basic amenities. I’d like to be able to travel with a trailer. 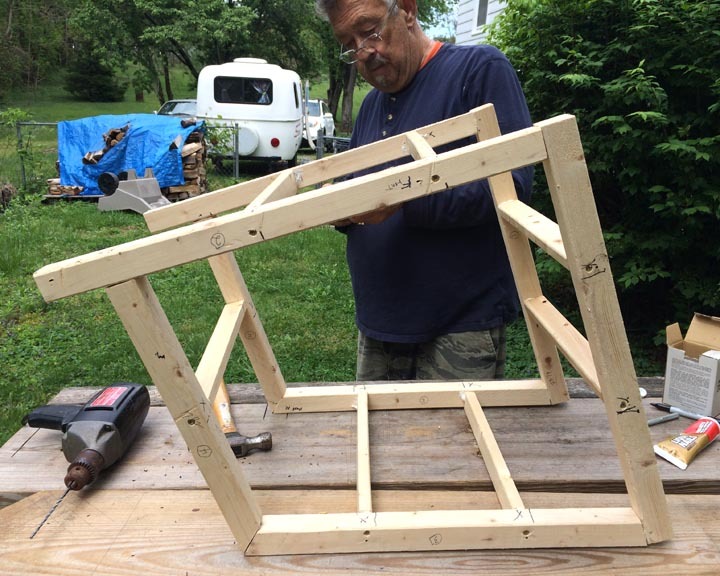 I did a LOT of it with my parents when I was a kid–and LOVED it!–but if we decide to just keep it local, then maybe keeping the Scamp would be the best option–and we could try to find someone who could make the repairs for us. 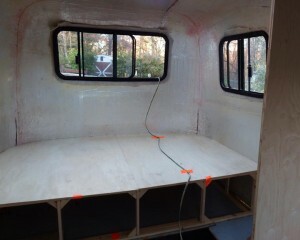 THEN we could continue with the plan to add a fridge, sink, etc. So it’s a tough call, in many ways. We know this trailer. We know how it tows, we’re getting better (not good, but better) at backing into places, and it’s been our baby. 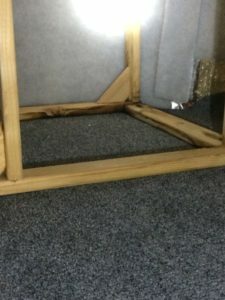 We’ve already made the initial investment for it, all prior renovation and repair costs have been paid for, the taxes and insurance aren’t bad, and we have greatly enjoyed it each time we’ve taken it out somewhere. So this is where we are. And we really don’t know which way to go from here.